Significant capital and operating costs for preparation of iron ore (concentration and agglomeration of ore) and coke production in many cases do not allow to organise efficient cast iron production on a small scale (up to 1 million tpy). 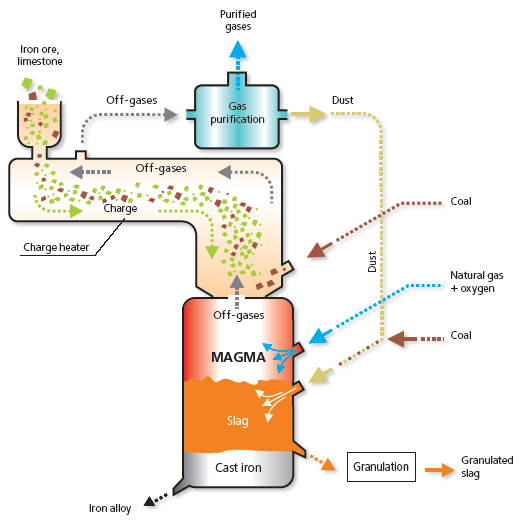 Organisation of iron production by the method of direct reduction does not require same high expenses for preparation of iron ore.
With relatively small capital costs, MAGMA can be used for efficient coke-free production of small amounts of cast iron from non-agglomerated iron ore. Charge (iron ore, limestone), before feeding to the unit, is preliminary heated up by off-gases of the smelting chamber in a rotating cylindrical heater to temperature 900-1000°C. At such temperatures, process of partial decarbonisation of limestone proceeds with formation of lime and partial reduction of iron oxides. Charge heated in the heater is fed to the surface of the molten mass, charge smelting and reduction of iron oxides occurs in the liquid bath. Coal required for reduction of iron oxides and adjustment of carbon content in cast iron is fed into the smelting chamber to the surface of the ore and lime molten mass and additionally injected inside by injectors. The dust captured by the gas treatment system is recuperated by injectors to the smelting chamber into the molten slag. Heat, necessary for smelting the charge, heating the molten mass, endothermic reactions of reduction of metal oxides and compensation of thermal losses of the unit, is fed into the working space of the smelting chamber with gas-oxygen burners. Cast iron and slag are released from the unit non-continuously. Chemical composition of slag is close to the composition of blast furnace slag. Production capacity of MAGMA depends on size of melting unit, type and content of feedstock and amounts 50,000-300,000 tpy of feedstock or up to 170,000 tpy of cast iron.